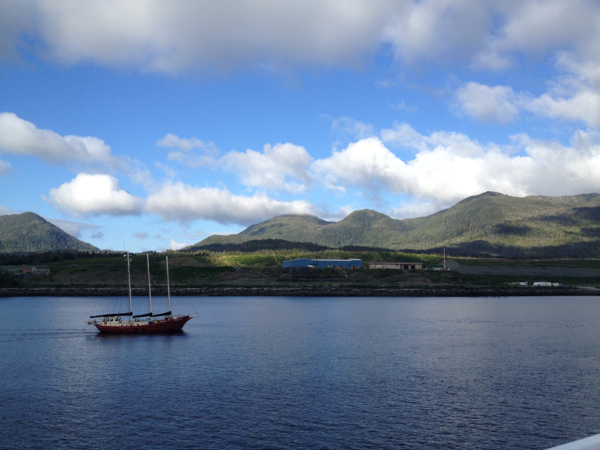 Between the windy roads and rocky boat rides, I should have had my head in a bag for the last week. Thankfully, I’m not prone to motion sickness. By the time you get this, I’ll be driving the Alcan and camping in the Alaska wilderness. But right now, I’m on a boat. Writing. I might be one of 5 passengers out of 200+ that has a computer on board. It’s an understatement to say I’m out of place among the eclectic mix of fishermen, middle aged men who insist on wearing zip-off pants, and retired couples with their RVs parked below deck. 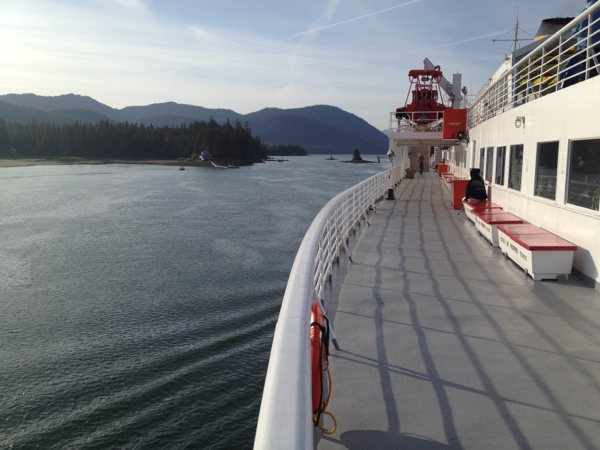 This is not a cruise ship, this is a ferry, run by the US government that travels the Alaska Marine Highway to bring folks to places where arriving by water is more efficient than by land (or in some cases, the only option). If you don’t reserve a “stateroom” in advance (or choose not to), you’re invited to camp on deck. Literally pop a tent and camp on the deck of the boat. Or just roll out your zero-degree sleeping bag and gaze at the stars (if you can see any after the 10pm sunset, of course). 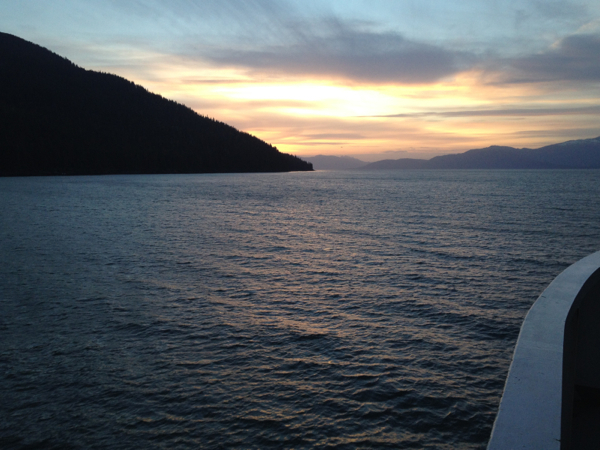 One of the few things the Malaspina has in common with a cruise ship is a bar, although I can guarantee you the ones on Carnival ships aren’t federally operated. 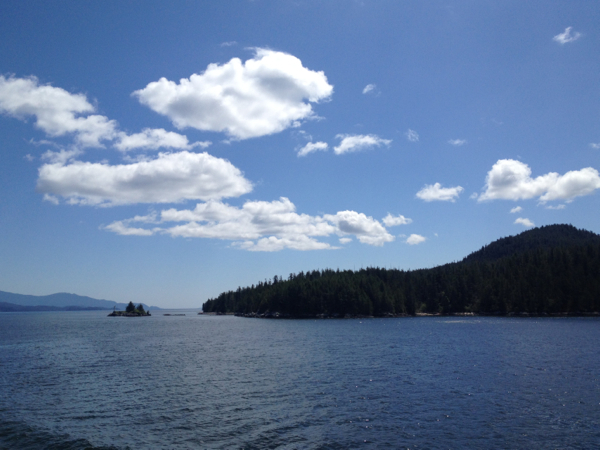 As we make our way through Canadian waters and now (finally) through Alaskan waters, I feel very tiny, dwarfed by the vast undisturbed landscape. 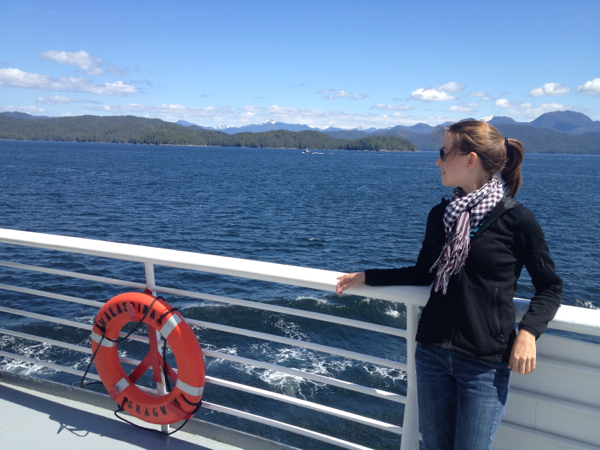 The sight of breaching whales right off the boat is almost routine, as are bald eagles perched atop conifers. Any sign of human life other than boats is so unusual that passengers rush the windows to take photos of lone Canadian outposts and abandoned canneries. 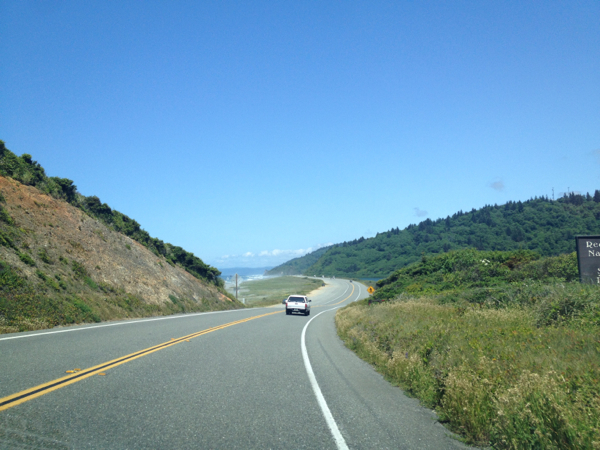 Driving through the California redwoods, which we did less than a week ago, is child’s play compared to this. After a few days on the ferry, I realized how silly I was to have snapped a dozen photos of water-trees-and-sky while pulling out of port. Every photo I take is a variation of the same. And that’s not a bad thing. It’s hard to write in complete sentences because every time I look up there’s a new sight unseen that demands my attention. It’s like digging through post cards at a gift shop and trying to choose between the top 10. As always, photos are a sad attempt to capture a landscape so breathtaking, but I include some below nonetheless. I’ve had my fair share of adventures along the road, hopping from city to city and from friend to friend, but the 1,000+ mile ferry ride takes the cake. Since leaving California, we cruised through pastoral Oregon, got a taste of Portland(ia), lunched at a Middle Eastern food truck in Olympia, and eventually made our way to our final hosts in Seattle, where (I kid you not) at least 3 independently owned coffee shops litter each block. 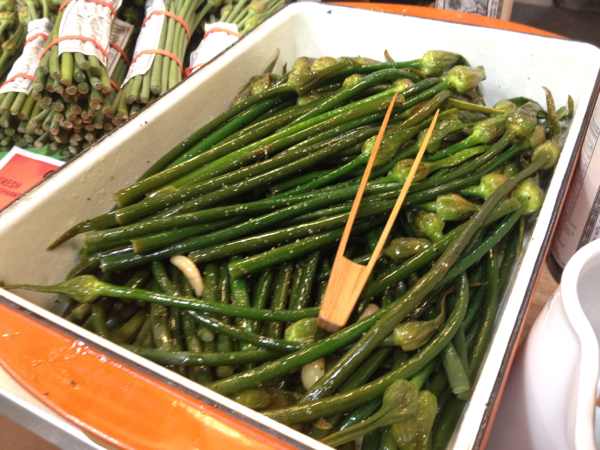 Oddly enough, on a trip where I imagined eating fewer vegetables than normal (even with my real food road trip snacks on board), I was actually introduced to a new vegetable: garlic spears. These are the flower stems of elephant garlic before they fully bloom and their flavor and texture are similar to asparagus, with just a hint of chives. I can already tell Alaska is like no other place on the planet and yet a place I’ll feel very much at home. Have you ever visited a place where you felt overtaken by the scenery? Tell me about it in the comments. I can’t wait to hear about your adventures or dream vacations. Or if you just want to wish us fair weather on the remainder of our journey, that’s appreciated too! PS – Big thanks to my nutrition clients (both current and waitlisted), who are patiently waiting for my return to reliable wi-fi and phone reception. Your emails and voicemails will have my attention in about a week. 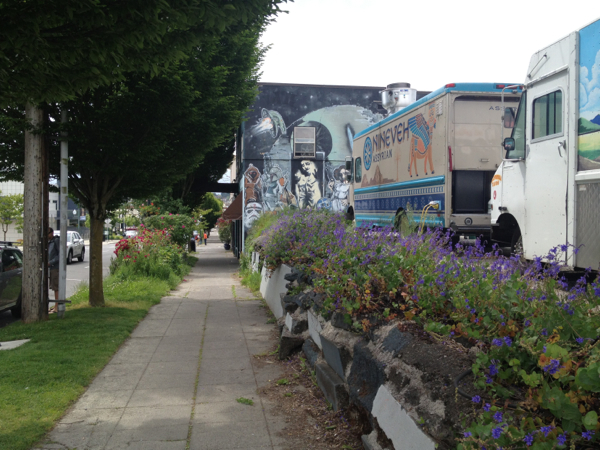 If you’re ever in Olympia, stop at the Nineveh Assyrian food truck. 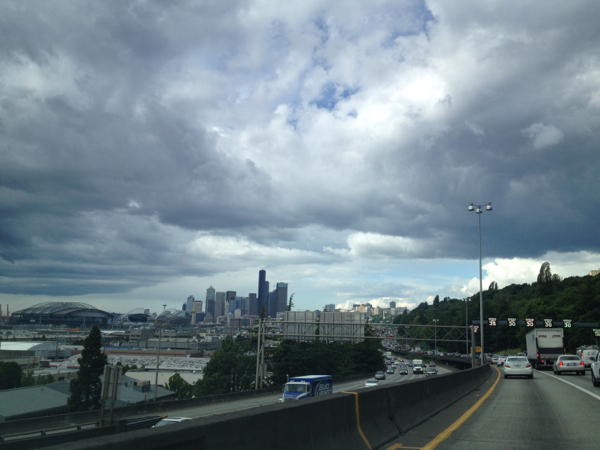 Seattle looking especially beautiful and expectedly overcast. My new favorite vegetable, garlic spears. One of many islands, large and small, that we passed while on the ferry. Sunny skies and great views. Pulling into port in Ketchikan when this sail boat, Alaskan Gypsy, passed by. 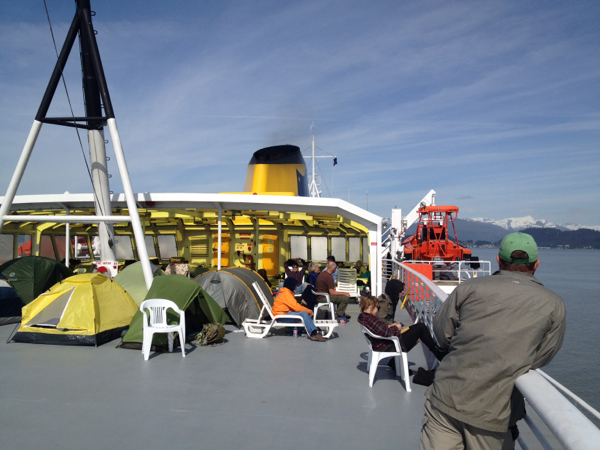 When I say people camp on deck, I mean people camp on deck. They call this “the narrows” for good reason. Sunset after 10pm with snow-capped mountains in the distance. Beautiful pictures, thank you for sharing. I’m sure it is much more beautiful in person. 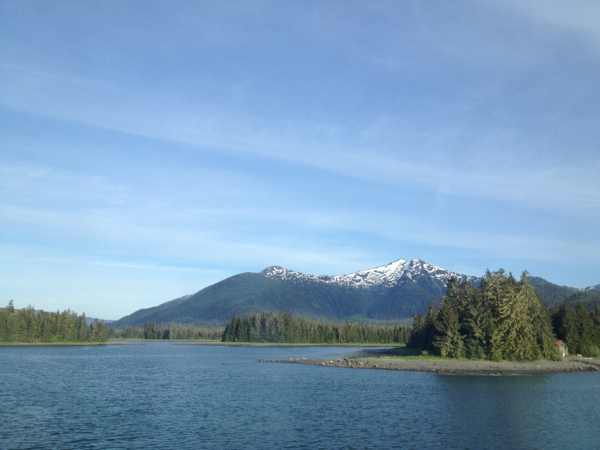 I went on a land and sea tour 3 years ago and fell in love with the beauty Alaska has to offer. I remember the stillness in everything. Wow Joanna, your trip sounds amazing! It really is quite shocking how much undisturbed land is out there. Very serene. What a treat these photos are. Keep them coming. Love them! !